It was a stint working in the kitchens at Geranium in Copenhagen that prompted Estonian chef Andrey Korobyak to team up with restaurateur Alexandr Zaturinsky and launch MØS, a Scandinavian eatery in Moscow. Designer Ekaterina Waltz of local firm Büroe, established the theme by taking inspiration from 1930s hotel foyers in Sweden and the functionalism of Russia’s Vyborg Library, by Finnish architect Alvar Aalto. 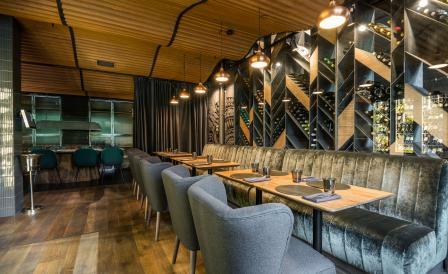 As such, an undulating timber ceiling panel hovers above a chic grey-hued space outfitted with plush custom-made seating and solid walnut tables. Meanwhile, copper pendant lighting and an angular glass-walled wine cellar add contrast and a dash of glitz. Sip on a cocktail by Andreas Tsanos before enjoying tasty morsels such as quail eggs with summer truffle and crispy onion or smoked whitefish caviar. All washed down with a glass of wine from the extensive list which includes local labels such as Lublu by Burnier.